A page celebrating our appearances as Sutton mascots - you’ll notice that we’ve claimed responsibility for the most incredible win in the club’s history and the victory that claimed the U’s highest honour. Call it arrogance if you will, I think the record speaks for itself - Played 3, Won 2, Lost 1, Goals For 7, Goals Against 2. Hopefully, we'll manage to dig up some more information on these games, so if anybody has anything we can add please feel free to email us. Probably one of the most amazing Birthday presents ever - being given the chance to lead out the yellows in front of a ‘huge’ crowd of just over five hundred. Can’t really remember much else of the occasion, apart from everyone seeming very tall (especially Nigel Golley) and that the U’s won 2-0 with goals from Matt Hanlan and Paul Rogers. However, it can surely be no coincidence that months later we went on to beat Coventry 2-1. Yes, I’m sure you can see where I’m going here - my luck remaining with the U’s for the next 4 months and, unfortunately, running out just before the trip to Carrow Road. Team: T. Roffey, R. Jones, T. Rains, V. Pratt, S. Hemsley, P. Rogers, M. Stephens, M. Cornwell (P. Dawson), L. Dennis, M. Hanlan, N. Golley. Sub (n/u) S. Turner. Running out with the team will be a special Birthday treat this afternoon for Paul Loughlin, who is nine years old today. Paul attends Westbourne Primary School. Like many of our mascots, he plays football in the West Sutton Little League; he also enjoys cricket and reading and is a member of the 1st North Sutton Scouts. Paul's two favourite Sutton players are Trevor Roffey and Paul Rogers. Above left: Pictured with my favourite players - Trevor Roffey and Paul Rogers. Above right: Here the captains and officials exchange pleasantries, though the Stafford captain looks like he disagreed with someone down the pub the night before. In the first of my two stabs at being mascot, Sutton were defeated by two goals to nil on my 8th Birthday (thanks for the great result, lads!). Having met the team and joined them for the first warm-up, Phil Dawson put me through my paces with a gruelling . training session. 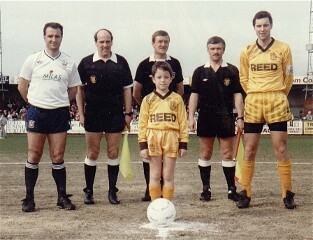 Then followed a few penalties against Trevor Roffey before heading off to the centre circle for the coin toss with captain Nigel Golley. To be honest, I can’t remember particularly much about the match other than the final score - the records show that we were thirteenth in the league following the game but finally pulled twelfth out of the bag by hammering Barnet 5-1 on the final day of the season, Efan Ekoku scoring his first hat-trick for the club. David Loughlin is eight years old today, and is celebrating his birthday by warming up with the team today. By a coincidence his brother Paul celebrated his birthday in September as our mascot against Stafford. 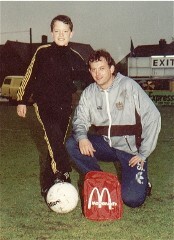 David attends Westbourne Primary School, for whose football team he plays. He is also a West Sutton Little League player, and apart from soccer he enjoys cricket, swimming, reading and playing with computers. 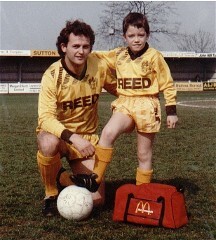 His favourite Sutton player is Paul McKinnon. Happy birthday, David! In the pictures below, you'll notice that the U's kit is different from that worn earlier in the season (see my brother's game, above) - United fans will be only too aware that the new kit was brought in for the Coventry game. 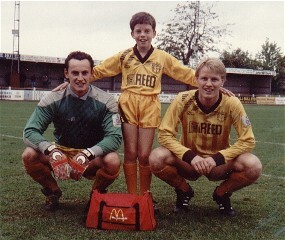 Above left: Posing for a photo with U’s record goal scorer Paul McKinnon. 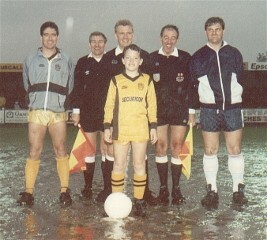 Above right: Prior to the kick-off with U’s captain Nigel Golley, the Kettering captain and match officials. After the luck I brought the team first time round, it was something of a surprise to be asked to be mascot for the match that secured The U’s their highest ever honour. On an incredibly wet night, Sutton ran away with the match scoring five goals without reply to win the final 6-1 on aggregate. Goals on the night were scored by Stuart Massey, an own goal, Andy Barnes (scorer of the goal in the first leg), Gary Elliott and Robin Seagroatt. Unfortunately, the season was to end in disappointment as United were relegated from the Conference - frustratingly much of the best football had been played in the League Cup run. 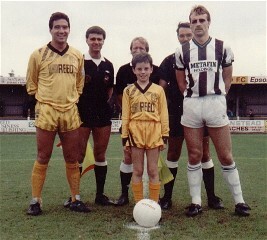 Above left: Another mascot appearance, another photo with my fave U’s player, Paul McKinnon. Above right: The wet conditions are noticeable as I line up with Tony Rains, the Barrow captain and the men in black.